Okay Rachel, we are counting on you - our European collection connection. You know you love to shop. 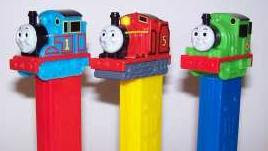 What could be funner than shopping for only-available-in Europe PEZ? WINX - characters based on a wildly popular Italian Kids Club show. TWEETY & TAZ - some special European editions and with special stem printing of the popular Warner Bro. characters. MONSTERS & ALIENS - from the Dreamworks movie released earlier this year. If we ever get these it is up to our European trotting sister. Rach, you can get your Christmas shopping all done with real European souvenirs for everyone. Good luck Rachel, find Thomas the train for Elizabeth she is obsessed with him. Dad, I know you've done the research, which stores should I look for? Actually, my dear, I have not done a spot of research on where to buy PEZ in London or France. I will but the task under my bonnet and see what I can find out. I found an old web site that gave a list of where to find PEZ in various countries of the world. It is 10 years old, but it said what I would expect. France: I would think it would be the same as England. They acutally have Toy-R-Us in France too maybe this site will have a store locator http://www.toysrus.fr/. The big chain in France is found at this site http://www.lagranderecre.fr/ . Reportedly there are many of these in Paris. Hey dad - when are you going to post the great PEZ I got for my birthday??? They are fantastic. Oh Mom, This European connection is too important to be topped. Don't get "Goofy" on me about your birthday PEZ post. It will come.